Back in December, emails leaked from the Sony hack revealed that Sony Pictures is contemplating a crossover between their 21 Jump Street and Men in Black franchises, which will presumably both come together in 23 Jump Street. 21 Jump Street and 22 Jump Street director Phil Lord revealed last month that their "crazy idea" for a crossover is still in play. Phil Lord's directing partner Chris Miller has now chimed in on the crossover, revealing that it's still very early in the development process, and that he is currently working on it with stars Channing Tatum, Jonah Hill and 22 Jump Street writer Rodney Rothman. "Well, it's very, very early on in this crazy fever pitch, but it's definitely a really interesting concept that makes you think. Talking about it, developing it with Jonah and Channing and Rodney and the studio, we can't just do the, 'Hey, it's the same thing again' schtick because we did that already." He added that the 22 "sequels" they teased at the end of 22 Jump Street are all "canon," and that if they do make another sequel, it will be very different. "If we're going to do something, it's got to be different but still have that same very specific Jump Street flavor to it." 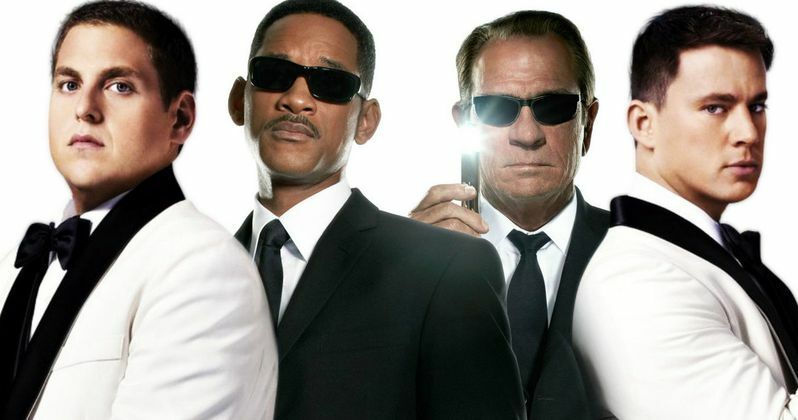 The hacked emails from December indicated that Men In Black stars Will Smith and Tommy Lee Jones would not star in the crossover, but there could be the possibility of cameo appearances. Unfortunately, Chris Miller did not add any story details revealing how these franchises would cross over, but you may recall that before Will Smith's "Jay" became an MIB in the first Men In Black, he was an NYPD cop. Perhaps the spin-off would focus on Schmidt and Jenko being recruited into the Men In Black somehow, but that is all speculation.